Intact’s TV division is leading on five time intervals (Whole Day, Morning, Day Time, Access, Late Fringe) on Urban All target; and on four intervals (Whole Day, Day Time, Access, Late Fringe) on the National target. Intact is the only media group in Romania with three TV channels in top 10 TV all stations. Digital Antena TV Group has 3 websites (a1.ro, www.antena3.ro și www.spynews.ro) in top 10 all sites in Romania in June. Is audience leader during Day Time, on the commercial target. 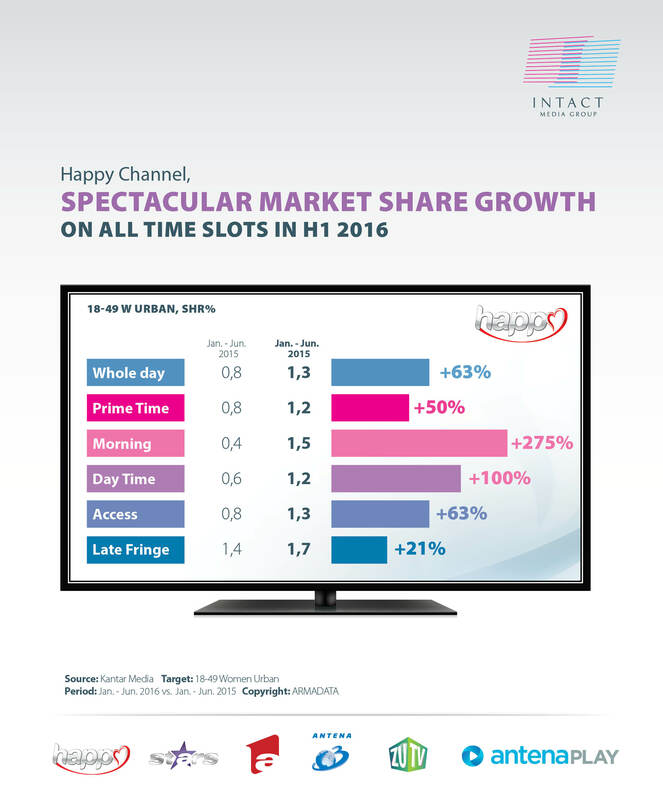 Intact’s generalist channel shows market share growth during Whole Day, Prime-Time, Morning and Day Time. It leads all TV channels during Day Time and Access slots. 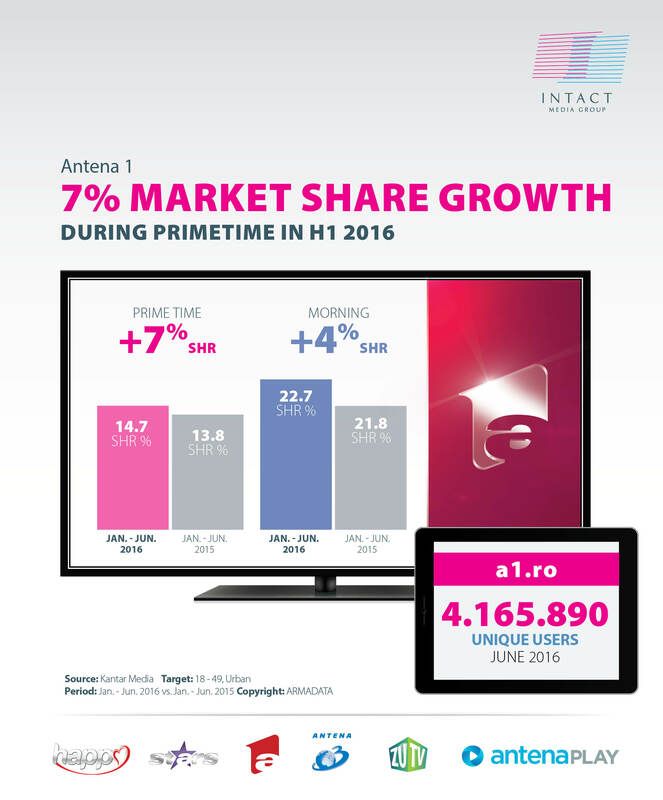 On the National target, Antena 1 boosts its audience on most of time intervals. iUmor, Game of Chefs and Temptation Island were the most watched productions in June, on the commercial target. a1.ro had over 4 million unique users in June. Is audience leader on most time intervals on the news niche (18+ target). Antena 3 occupies the fourth position in top 10 TV all stations, after the generalist channels. Sinteza Zilei, Subiectiv and Q&A (talk- shows) were the most watched productions in June. 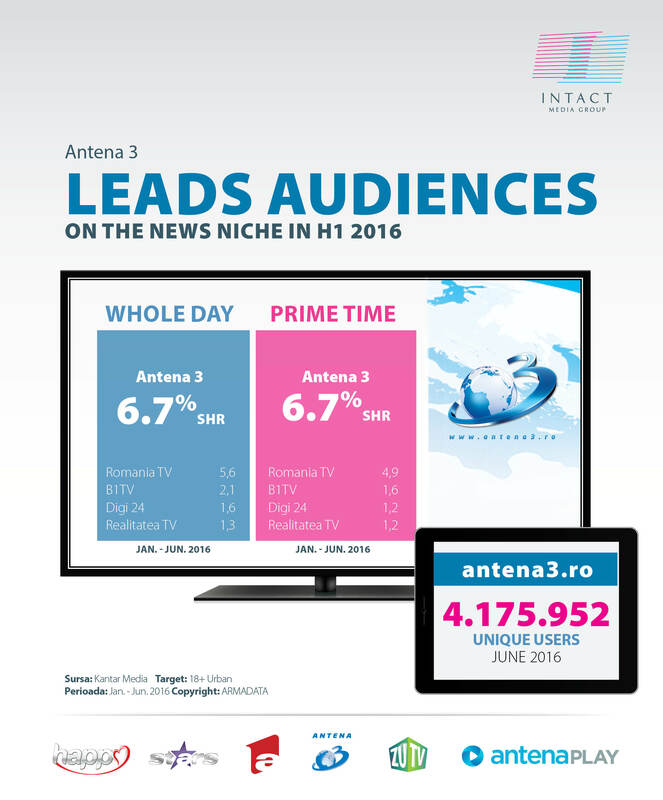 Antena3.ro had over 4 million unique users in June. Star matinal e pe val, Agentul VIP and Rai da’ buni were the most watched productions in June on the commercial target. Has significant audience appreciations on all time intervals, compared to the first semester of 2016 (+ 63 % in Whole Day and + 50% in Prime Time). Prizoniera dragostei (Never let go) had on average 34.000 viewers on the commercial target, women. The glades and Mi Corazon es tuyo were amongst the most watched productions in June. ZU TV scored significant audience appreciation in Access, 33%, on the 15-34 urban target. Noaptea târziu se vede la ZU, Most Wanted and ZU Trends were the most watched productions in June on the commercial target. In the first semester of 2016, more than ten million Romanians watched Intact’s productions during Whole Day, respectively more than seven million during Prime-Time, for at least one minute, on national level.